Rent by Season of comfortable Flats, type Chalés complete with American Kitchen, with differentiated values for Flats with Ceiling Fans or Flats with Air Conditioning. (information with the Owner). NOTE: All Values, advertised here, are Daily by FLAT / DAY, for a maximum of 04 people in each Flat with Ceiling Fans. All Flats with individual accesses by stairs and balconies, and excellent accommodation for up to 04 people, with 02 people in the room and 02 people in the living room in double sofa bed. They also have TV via Satellite Dish, Refrigerator, Cooker, Extractor Fan, Household Utensils, 2 American-style beds and a double sofa bed. In the social area of ​​the Condominium: pool, deck, Lounge with BBQ and Lounge, in addition to Internal Parking Walled. and no sign of pollution, in addition to the hospitality and natural joy that the place provides. with internal parking for 01 vehicle walled by Flat. water tank for 26,000 liters + semi-artesian well. Beach, sea and mountains, unpolluted with the remaining 7% of the Atlantic Forest! to the International São Paulo / Guarulhos Airport - Governador André Franco Montoro. and internally excellent accommodation for up to 04 people in each Flat Residence. Internal parking and Walled to 01 vehicle by Flat. The owners are also residents in the Condominium and are available if needed. and no pollution signal, as well as hospitality and natural joy that the place provides. Beach and sea without pollution, with the remaining 7% of the Atlantic Forest! 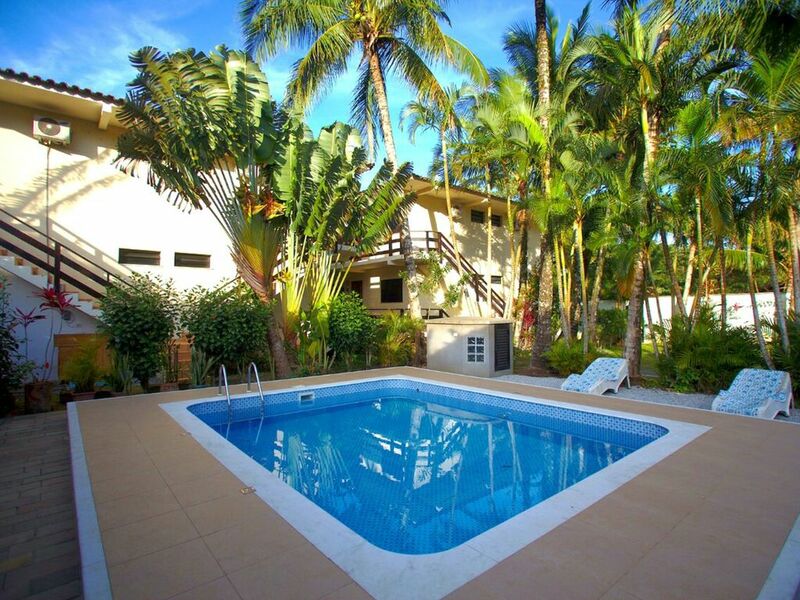 Maresias Caracalla Flat - Close to local shops and all restaurants, bars and discotheques of Maresias ... plus access via Urban Bus sites, and facilitating also Intercity bus, going straight back-up to the International Airport of São Paulo / Guarulhos - Governador André Franco Montoro. Comfortable Flats, type complete Chalets, and differentiated lease value has Flats with air conditioning or only with ceiling fans (information with the owner). All Flats with access individualized for stairs and balconies, and excellent accommodation for up to 04 people, 02 people in the room and 02 people in the room with double sofa bed. Sea, Beach and Sierra, without pollution, next to the remaining 7% of Atlantic Forest! 01 = THE VALUES ANNOUNCED ARE FOR RENT BY SEASON, WITHOUT HOTELS, OF EACH FLAT WITH CEILING FANS / PER DAILY. 02 = FLATS DISPONES WITH AIR-CONDITIONED, OPTIONALLY AND WITH DIFFERENT VALUES. 03 = MAXIMUM OF 04 PEOPLE IN EACH FLAT, EXCEPT BABIES OF COLO, WITH EVEN VALUES FOR 01, 02, 03 AND UP TO 04 PEOPLE TOGETHER. We provide Flats for up to 4 people up to 52 people, with Ceiling Fans, and optionally Air Conditioning. Each Flat has 01 Room, for 02 people in 02 Single Beds Beds. For Couples, the beds are joined, being the size of a Queen Bed. In the Room, +02 People on a Double Sofa Bed. Each Flat has an Exclusive Bathroom, with Laundry Tank and Clothes Extension Clothesline. -: = WARNING =: - 01 = THE VALUES ANNOUNCED ARE FOR RENT BY SEASON, WITHOUT HOTELS, OF EACH FLAT WITH CEILING FANS / PER DAILY. (Information with the Owner). 02 = FLATS DISPONES WITH AIR-CONDITIONED, OPTIONALLY AND WITH DIFFERENT VALUES. (Information with the Owner). 03 = MAXIMUM OF 04 PEOPLE IN EACH FLAT, EXCEPT BABIES OF COLO, WITH EVEN VALUES FOR 01, 02, 03 AND UP TO 04 PEOPLE TOGETHER. (Information with the Owner). 04 = VALUES ARE DIFFERENT IN LOW-SEASON, HIGH SEASON, HOLIDAYS, CHRISTMAS, REVEILLON, CARNIVAL, ETC ... (Information with the Owner). GENERAL INFORMATION: We provide Flats for up to 4 people up to 52 people, with Ceiling Fans, and optionally Air Conditioning. Each Flat has 01 Room, for 02 people in 02 Single Beds Beds. For Couples, the beds are joined, being the size of a Queen Bed. In the Room, +02 People on a Double Sofa Bed. (I.e. Facilitating access are also available Intercity bus, going straight back-up to the International São Paulo / Guarulhos Airport - Governador André Franco Montoro. Sea Beach and Serra, no pollution, with the remaining 7% of the Atlantic Forest!